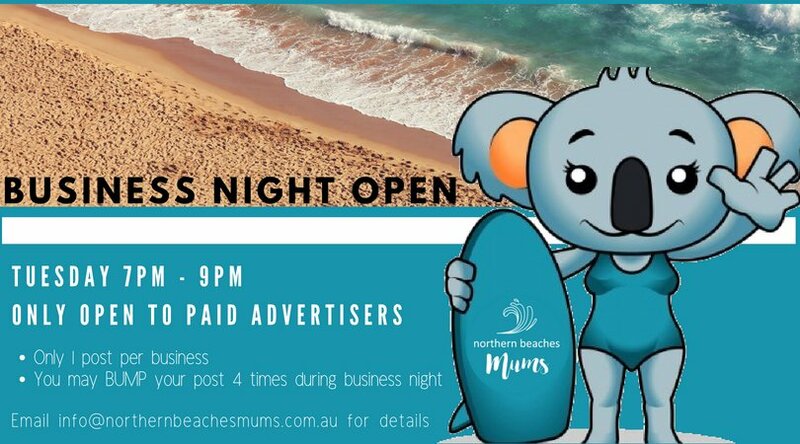 Each Tuesday evening, we run Business Night in our Northern Beaches Mums Facebook Group from 7-9pm. Want to know more? All members may post during this time, but only those members who have a business directory listing with Northern Beaches Mums can advertise their business. I have a Business Directory Listing but I’m not a member of the group. Can I join? Absolutely. We’d love you to join. Simple head to the group and click “Join”. Please note, you cannot join using a business profile, only a personal profile. You will be provided with full details of the group’s rules when you join, please note it is your responsibility to adhere to these rules. Any member who breaks the rules may be removed, including advertisers. How do I make a post during Business Night? Enter your advert copy. Pleas ensure you mention your Business Name and add links to your URL. Click “Add Photo/Video” and upload 1 image or video. Write a blurb to sell your product/service with any relevant contact details and links. Please no “going live”. These will be removed. I have a directory listing but I am a man. Can I post? We don’t allow men to join our group so if you have a business directory listing and want to make the most of it with regular posts during Business Night you need to enlist the assistance of a female friend/family member/colleague to post on your behalf. Are there any rules around what I can post? You may bump your post up to 4 times during Business Night by commenting on the original post. Please note, this bump can also include further business information and or images. You must not bump the post again after Business Night unless replying to a direct question. You must post a new post every week so that it can go through the approval process during business night. Business Posts can only be made by holders of Business Directory Listings on our website. Do not ask anyone to comment on the post to bump it. Do not pm members who have not asked to be pm’d. I can’t get online between 7pm and 9pm to post. Can I post earlier or later? Business Night posts must only be made between 7pm and 9pm on a Tuesday. Any business posts out with this time will be deleted. Alternatively, we operate a Social Proxy Service whereby we can post on your behalf. For more information about this is service please contact us. How can I book a directory listing so I can post during Business Night? If you would like to post during Business Night please contact us for details.